The local town festival is named after its famous product, the tostado. A locally made cookie, researches failed to establish as to when and how or from whom the baking of these cookies originated. For the residents of Santander, these cookies made of sugar, flour, eggs, baking soda and shortening have been sold in their place for as long as they can remember. 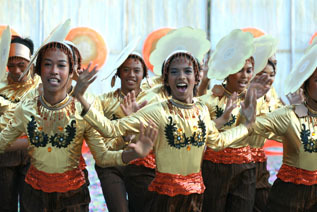 Launched in April 2006 as highlight of the activities of the town fiesta, the tostado festival is among the first festivals conceptualized among Cebu’s towns. The festival has since brought more life and color in the townfolks’ celebration of the fiesta of the town’s patron, St. Gabriel Archangel. Not only that, the festival has given pride to the people of Santander as its dancers have since been joining prestigious events in Cebu and Mandaue Cities, with dignitaries and visitors from other provinces and countries as audience. Showing local culture and tradition by depicting the steps in making the tostado, this festival serves as the world’s window to Santander.